In 1996, Bill Gates wrote his famous article “Content is King”, published it on the Microsoft website, and began the double decade long debate that has progressed stirringly through the inception of content marketing as a major advertising medium of today. Last week, we posted a blog defending content from the growing trend of sardonic bloggers making their marks as professional contrarians with attacks on the form, such as this one, but we decided that, so long as these silly publications keep churning out the cheap buzzword based clickbait, we’ll back our argument up with a real example. At what was, quite literally, the edge of space. In 2012, Felix Baumgartner of Salzburg, Austria achieved the daredevil equivelant to…well… we suppose the point was that there is no equivalent… but in the process of this unparalleled feat, he definitely broke new, high ground for the Redbull Stratos Project. A perfectly simple stunt, which took the physicalized definition of height and pushed its appeal to the absolute limit, marked an inspired step forward in Content Marketing. 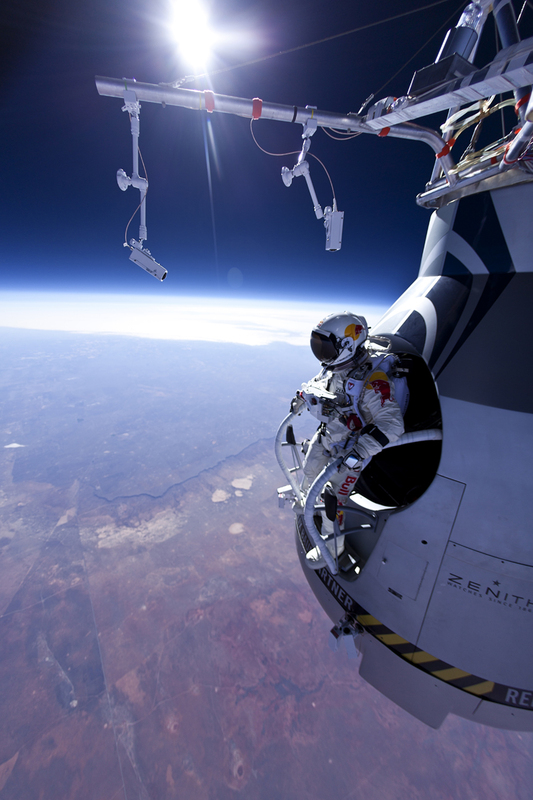 Leaping from a helium balloon 24 miles above the Earth, Felix became the first person to break the sound barrier without the support of engines, and now holds the record for highest sky-dive in history. But you see, there was no real achievement here for science itself, only an action worthy of attention, and a label people recognized so much that they could continue to recognize it on a spacesuit. If you check out the Wikipedia page, you might just forget that Redbull had no real dog in this fight, save for the emblem on Baumgartner’s pressurized suit. The entire project, however beneficial for mankind some people deem it to have been, was literally just an excuse to jam the Redbull brand into the collective consciousness of the world. And it worked. But this wasn’t the first time Redbull had dabbled in the art of content marketing. Redbulls’ Flugtag has been a staple of silly event coordination for the sake of energy drink sales for years now. A simple competition of (rarely working) flying contraptions in operation for over a decade, Flugtag combines the appeal of launching grown men off high ledges in bulky nonsense machines with that oh-so recognizable double scarlet bovine insignia. Once again, an entire event is crafted annually with no regard for vocational productivity or a contribution to culture, regardless of how citizens utilize it, for the sole sake of advertising. New York Red Bulls: soccer franchise. Red Bull Racing: Formula One team, World Constructor’s Championship winner of 2010, 2011, 2012 and 2013. Red Bull Sailing Team: extreme Sailing Series racing team. Scuderia Toro Rosso: a second Formula One team based in Italy. Team Red Bull: a NASCAR racing team. FC Red Bull Salzburg: an Austrian football club. EC Red Bull Salzburg: a member of the Austrian Hockey League. EHC Red Bull München: a German hockey team. Red Bull Brasil: another football club. Red Bull Racing Brasil: a Stock Car Brasil team. Red Bull Ghana: a Ghanaian professional football club. StarTale: a professional Starcraft 2 and Counter-Strike: Global Offensive team. And those are just a handful of them. Now we know what you might be thinking- that this is all well and good but most companies can’t afford any campaign nearly the size and scope of these Redbull exhibitions. But just because you can’t go big, doesn’t mean you can’t go. So tell us your more moderately sized ideas! In the comments below, on our Facebook wall or at our Twitter page, what are some more practical utilization of content marketing?